The eternal is a subject that challenges the mind and indeed, to attempt to approach the meaning of it is but to only show the limits of the human imagination. As surely as we try we fail to measure any aspect of it. However, here is offered a creatively intuitive approach by using some known concepts in which we might portray it as may be conceived by the physical mind. Yin-yang is an ancient expression that looks upon that which is endless or eternal, and by its nature is being born over and over in a continuing cycle of rebirth, in an ongoing process of exchange and renewal of elements. These exchanges and renewals may even be evident to some degree and naturally expressed in what we call evolution. It represents almost literally a reincarnation of life and substance in every imaginable form. This portrayal of elements familiar to the human mind represents such an eternal cycle that we are witnessing even now. The theme is centered around the Yin-yang symbol familiar in Eastern cultures for millennia. The Yin-yang here is portrayed as the central force around which all matter and life revolves in an eternal cycle. One might start on the lower left quarter of the circular composition, beginning with that which we know the least. The timeless and limitless universe out of which all matter as we can imagine it is being transformed or coalesced into stars, planets, gases and other matter. Eventually it may flow through unimaginably powerful forces in raging landscapes of molten, violent, and seemingly lifeless chaos. That chaos then cools down and settles into the more familiar results such as volcanoes and quaking vistas of hot and barren worlds. As the cycle moves on, in this case in a counter-clockwise direction, things continue to cool and strange elements rearrange into more familiar elements such as oceans and primitive plant and animal life forms, then more complex species such as mammals and reptiles. Eventually plant life begins to diversify and give way to even more complex life forms on land. As enormous spans of what we call time pass, we ultimately see the rise of humanity and a more current look to the landscape. Birds, weather patterns and the familiar sky reach back into the space beyond, and giving way to the unknown a new round of naturally creative activity starts that ultimately may come back around to new life. The gray brain matter in the left half of the central Yin-yang shape represents the development of primitive reasoning and is shown as if asleep with a closed eye. 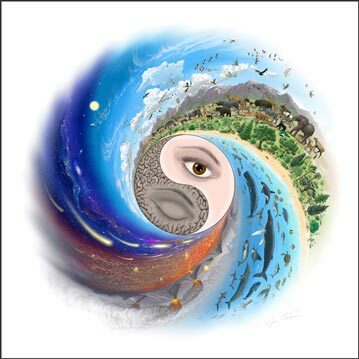 The other portion of the Yin-yang represents an open eye to symbolize the awakening of awareness and intelligence and is more closely aligned with the advance of life on land and in the sea. The details in this image can only be seen clearly and appreciated in the original or a large print.